Winner of the Nobel Prize in Literature On April 26, 1986, the worst nuclear reactor accident in history occurred in Chernobyl and contaminated as much as three quarters of Europe. Voices from Chernobyl is the first book to present personal accounts of the tragedy. Journalist Svetlana Alexievich interviewed hundreds of people affected by the meltdown---from innocent citizen Winner of the Nobel Prize in Literature On April 26, 1986, the worst nuclear reactor accident in history occurred in Chernobyl and contaminated as much as three quarters of Europe. Voices from Chernobyl is the first book to present personal accounts of the tragedy. Journalist Svetlana Alexievich interviewed hundreds of people affected by the meltdown---from innocent citizens to firefighters to those called in to clean up the disaster---and their stories reveal the fear, anger, and uncertainty with which they still live. 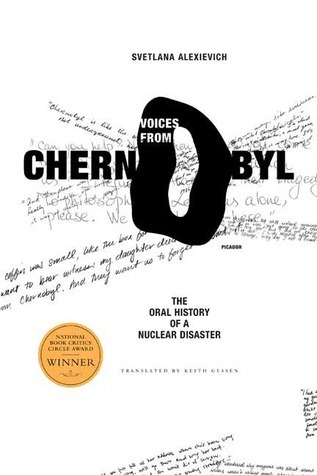 Composed of interviews in monologue form, Voices from Chernobyl is a crucially important work of immense force, unforgettable in its emotional power and honesty.